Previously seen in Canton Custom Guitars Design #2 and More on Canton Electric Guitar Model #2, the Equinox electric guitar is now complete. Let’s take a look. Rick spent a great deal of time carving the Equinox’s contours and the following shots really show these off. I love the way the top and back woods come together. You can also see the recessed strap lock button and the output jack locations. Any chance of a video, Rick? Rick: That really turned out even better than the original template design. I guess I don’t have the imagination that you have to see the shapes from the flat cutout. It is such a sensual guitar and the colors of the woods are very complimentary. It deserves some better photographs that show the intricate shapes of the contours. That is one of the nicest looking fretboards I have seen in some time. The flame on the neck is fabulous! If Rick can provide us with up close shots of the contours, I’m sure we can get them up for folks to see. Robert, I`ll work on sending you more pictures this week. Thanks Chris, really looking forward to seeing the “Forshage Acoustic” you`re working on for Roger. Needless to say, that makes two of us! And your guitar is gorgeous Rick. Congrats! Would love to hear how it sounds. I bet you`re anxiously awaiting the new acoustic from Chris indeed. Thanks for the info re: video cameras. I will be putting some effort into finding one so I can post some videos with the method you mentioned Roger. I would really like to hear it, to see how it sounds. It looks very nice and I bet it has no reasons to not sound lovely. I like most of the tones it offers so far Ovidiu, as noted above I`ll be working on finding a decent video camera. How is the progress with your unique bridge? Hi Rick.The Ergo 2 Looks absolutly stunning,and if it sounds as good as it looks your on to a true winner.and the orders i`m sure will come flooding in. Id like to know your views (and anyone else) with regard to pickup choice. I always thought that the Seymour Jazz was a little bright for neck position? That why i chose the Alnico Pro 2 for neck and the JB for Bridge..everyone thoughts are welcome. Cheers G.
Graham, I agree on the Duncan Jazz. I have an Alnico Pro II and JB on a Warmoth that I built 10 years ago. Great combo. It originally had a Jazz in the neck, as I was a newbie back then – too bright. In general, I think that chambered guitars benefit from pickups with some balls. I don’t mean high output metal types, but there may be a reason why you don’t see more semi-hollows with Strat single coils. A good PAF clone is hard to argue with. P90’s or their modern counterparts (e.g. 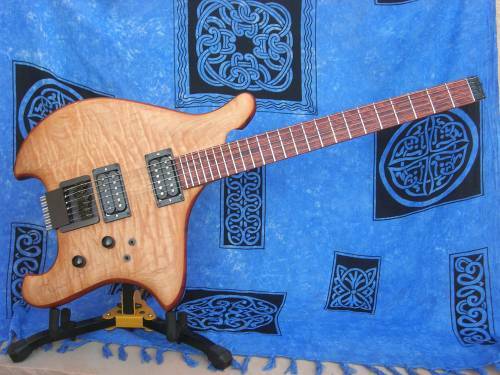 Harmonic Design Z90) can be great too. I have had similar experiences with the SD Jazz, ironically it sounds fatter than usual, I believe due to the goncalo alves. 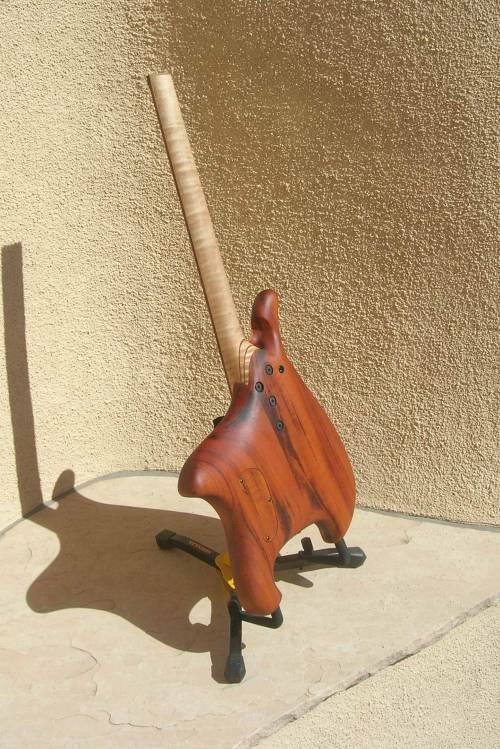 The “alves” has a mellow woody tone but ergonomically it is too heavy for anyone with back/shoulder problems. The Ergo2- I think I`m going to call it the “Equinox” has a good amount of chambering, plus the sculpting took away some weight as well, but even so, it is on the heavy side.I may use it again with a different body design and a lot more chambering. 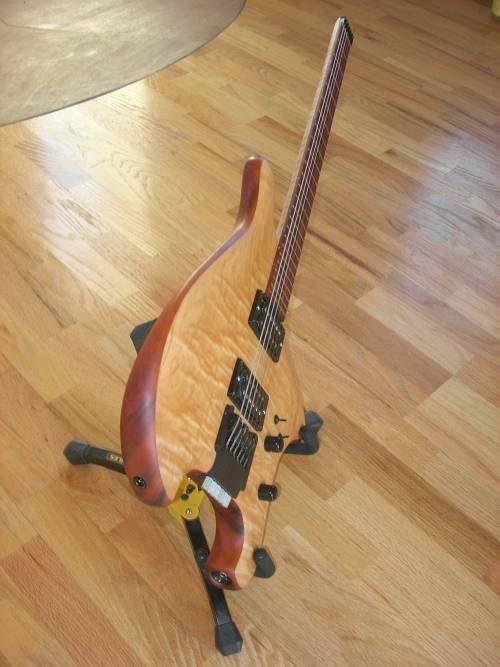 I wouldn`t hesitate to use it as a neck at all though..
Wow! 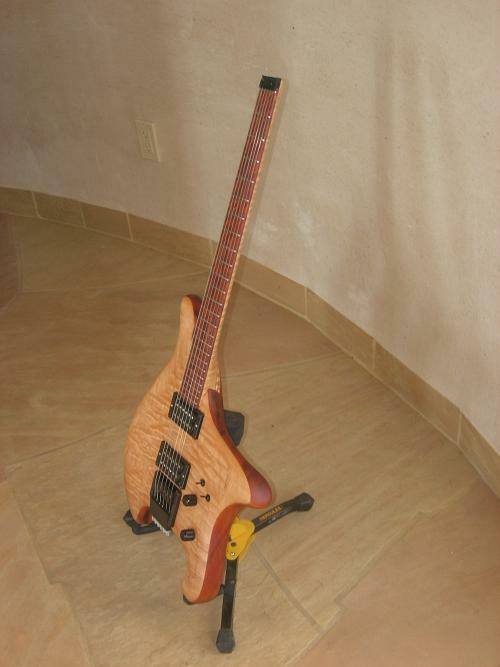 Rick, this guitar is fantastic..the shape is an imagination catalyst IMO..can’t wait until the guitar you are making for me is finished….. then I am going to order one like this with a GK3! Thanks Stephen, I`m glad you wanted to wait until my CNC is up running steadily for your design as the time frame for hand built is longer. 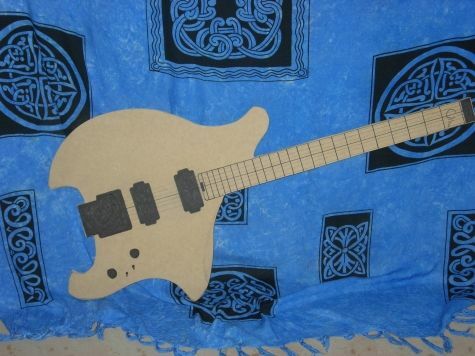 I am working on Al Shaffers model all by hand as he requested, although I used the CNC on his fretboard. When you are here, we will create your design in CAD & then head it over to the CNC. Whoa…that’s wild. I’d love to spend some time with this one! She looks great! Can you tell us the running price for one of these bad girls?? Thank you. Each guitar is custom and as you know prices change with options. The ballpark is somewhere around $2500.00 though. I had the great pleasure of visiting with Rick this afternoon, and got to play this instrument — its fantastic sounding as well!! its one of the best marriages of warmth and clarity ive ever ever played — nice natural sparkle and definition, but incredibly rich at the same time. honestly, i dont know how he did it, its very very magic. Notes have this amazing bloom and harmonic sense, great even sustain. ergonomically, its everything youd want – felt effortless in the hands and on the body. kudos, Rick – looking forward to working with you on our projects! How do i can order your guitar ?? re pickups – by JB, are you referring to the Jeff Beck, or a Jazz Bridge? Jeff Beck. A great midrangey, sustainy sort of bridge pickup. Nice, very nice , warm and special think!!!!!!!! Ä° play Yamaha AE500 Jazz Guitar with Seymour Duncan Alnico II pro bridge pickup.Great for fusion,drive is clearly and very fluid.Ä°’ll find best clean sounds with Alnico II pro bridge pickup in bridge position. This is a fantastic guitar! I am interested in more detailed information. Start with the first couple of links in the article and then do a search on the Ergo 2’s new name – equinox. That will turn up several other articles including Mustafa Stefan Dill performing on a fretless version, an article on the fretless Equinox guitar and Tim Miller performing on a fretted version.